A bit of a technical post this Thursday, on something I’ve written about before, but always meant to revisit. It’s taken a while, and though I upgraded to a full frame camera more than two years ago, this experiment has fallen down my priority list. I won’t get into the ‘which is better’ argument, since it all depends on what the user wants out of the camera, and both systems have their advantages. What I will get into is a comparison of what lenses (or rather, lens settings) are equivalent – that is, which lens settings give the same image when taken with the two cameras from the same position. Getting the same image boils down to two things really: a) field of view (FOV), measured as an angle, which dictates ‘what fits’, and b) depth of field (DOF), technically measured as the distance within which objects appear in focus. However, the FOV has a direct relationship with the focal length used, so people will usually think in terms of that (e.g. the part of the scene visible with a 300mm lens). Similarly, the DOF depends directly on the lens aperture, so people think in terms of that (e.g. the background blur effect at f/1.4). This is why, when comparing sensor formats, you often hear things like ‘equivalent to 480mm on a full frame’. Everyone is probably familiar with the multiplier used with the focal length. For example, most Canon crop sensor cameras have a crop factor of 1.6. This means that, for example, a 200mm lens used with a crop sensor camera will have the same FOV as a 320mm lens on a full frame camera. However, what is less obvious is that an f/4 aperture on that 200mm lens on the crop sensor will have the same DOF as an f/6.4 aperture on a 320mm lens on the full frame. 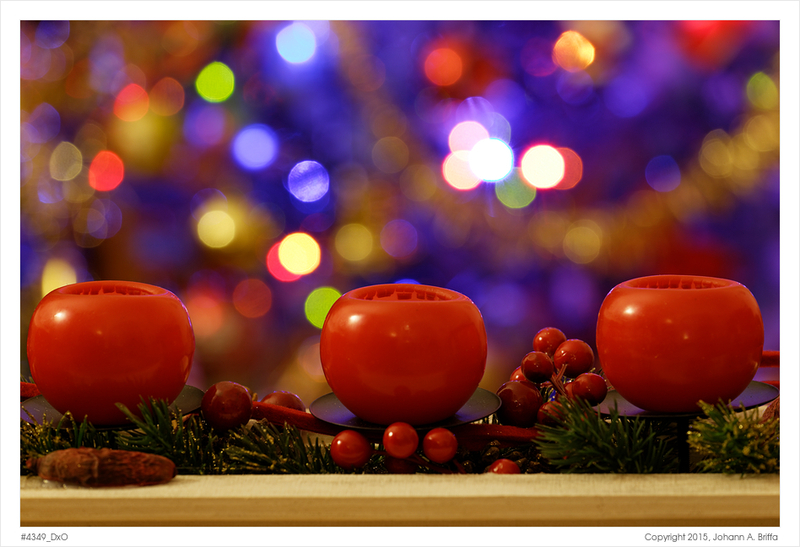 To demonstrate this, as an experiment I set up a scene with a Christmas candle centerpiece as a primary subject, with our Christmas tree in the background to show the effect on bokeh. I set the subject at about 2m from the camera, and the tree about another 2m further back. To avoid differences between lenses I used the same lens with both cameras – my 70-200mm f/4L IS. I fitted the lens to the tripod using its collar mount, making sure that the lens did not move when swapping cameras. The first photo, above, was taken with the full frame camera (EOS 6D) at 200mm and largest aperture. At ISO 100 this required a shutter speed of 2 seconds. I focused manually on the candles, and you’ll notice that the lights on the tree show up as out of focus disks. The DOF is so shallow that the front of the centerpiece is also out of focus. Now you can observe two things here. For starters, the exposure is identical – since the lens is still f/4 at this reduced focal length, at the same ISO I needed the same shutter speed as the full frame. However, the out-of-focus disks are smaller. This means that the DOF is larger than before. While this may seem counter-intuitive (it’s still f/4 no? ), it actually makes sense, and here’s why. We’re now f/4 at 121mm, not f/4 at 200mm. That is, the absolute aperture is now 121÷4 ≈ 30mm, which is smaller than the 200÷4 = 50mm we had with the full frame camera. Smaller aperture means larger DOF. Another way to look at this is to think in terms of equivalent aperture, with respect to DOF. So f/4 on the crop sensor is equivalent to 4 × 1.6 = f/6.4 on a full frame. As a final step in the experiment I swapped the full frame camera back in, set the focal length at 200mm, and stopped down the aperture to f/6.4. Since this is 1⅓ stops smaller, I needed to slow the shutter speed down by 1⅓ stops to 5 seconds. Observe how the image is now (approximately) equivalent to what we had with the crop sensor camera. So 121mm f/4 on a crop sensor gives the same image as 200mm f/6.4 on a full frame camera. However, of course, the full frame needs a slower shutter speed (by 1⅓ stops) to get the same exposure. Alternatively, of course, I could have increased the sensitivity on the full frame from ISO 100 to ISO 250 and kept the shutter speed at 2 seconds. Any given lens on a crop sensor camera will give the same image as a lens with both the focal length and aperture multiplied by the crop factor on a full frame camera. A crop sensor camera will give you more reach with the same lens. This can be an advantage for some types of photography (a 300mm lens on a crop sensor has the same reach as a 480mm on a full frame). However, keep in mind that the same effect happens at the wider end – for the same FOV of a 16mm lens on a full frame you need a 10mm lens on a crop sensor; fortunately you can usually find such wide lenses, but only for crop sensor cameras. A full frame camera will give you more background blur with the same aperture. This can be a bonus for those dreamy portrait or macro images. But it also means that working with such a narrow DOF is more challenging (focus needs to be spot on). When you need more DOF (e.g. landscape work), you need to learn to use the smaller apertures well. I hope this has been helpful. If there’s any aspect you’d like to discuss further, feel free to drop a comment below. Excellent piece, beautifully explained, with great photos to boot!